CDC To Urge Swine Flu Vaccine For Pregnant Women CDC advisers want pregnant women and their doctors now more than ever to heed guidelines to get vaccinated. A new study of the first two months of the swine flu outbreak shows that if infected, pregnant women are more likely to get severe flu. Bottles of swine flu vaccine at the Flinders Medical Center in Adelaide, Australia, in July. Australia is conducting the world's first human trials of a swine flu vaccine. Advisers to the Centers for Disease Control and Prevention are recommending that pregnant women be near the front of the line for swine flu vaccination. Those recommendations are based on new data from the CDC that paint a picture of how the first wave of swine flu affected pregnant women. The study, published online Wednesday in the British journal The Lancet, shows that pregnant women infected with the pandemic H1N1 influenza strain have a much higher rate of hospitalization. But recommendations that pregnant women be vaccinated will be a hard sell to pregnant women — and their doctors. Dr. Iffath Hoskins saw firsthand this spring what the new pandemic virus can do to healthy pregnant women who start out with ordinary flu symptoms. "We've seen them get very sick, very quickly," says Hoskins, chief of obstetrics and gynecology at Lutheran Medical Center in Brooklyn. One case haunts her. It was a woman in her 20s who came in with a high fever. She went into labor and delivered a severely premature baby, and then she was put on a ventilator. Her baby died, but it wasn't until she was weaned off the ventilator two months later that she was told. "As we were weaning her off, I didn't want her to be told until I was sure she was actually awake. It was hard," Hoskins recalls. Most of her pregnant patients are pretty casual about getting the flu, says Hoskins. "Normally we say, 'Oh, it's only the flu. We know it's the season.' You know, two or three days of aches and pains, chicken soup. But in pregnancy, we should take it very seriously, because in general pregnant women get sicker for longer." According to the CDC study, of the 45 deaths reported to the agency during the first two months of the swine flu outbreak, six were pregnant women. Six deaths out of 45 doesn't sound alarming, but it's 13 times higher than the proportion of pregnant women in the total population. There are 3.4 million pregnant women in the country at any given time, and that percentage of deaths could increase this fall and winter, when experts expect a higher rate of swine flu infections. Health officials have had a difficult time in general persuading pregnant women to get vaccinated against seasonal flu. The CDC has stepped up its campaign over the past five years, yet fewer than 15 percent of pregnant women get seasonal flu shots. "There's a real hesitancy on the part of pregnant women to take anything during pregnancy," says Dr. Denise Jamieson, an author of the new CDC study. "A lot of women want to avoid all medications and all exposures." Hoskins sees that reluctance all the time. "I'll say, 'Mrs. Pregnant Lady, you need A and B and X.' And they say, OK. And then when I start offering the flu vaccine, they say 'Let me think about it. Do you really think I should? It's only flu.' "
And it's not just pregnant women. Their doctors are reluctant, too — both to vaccinate and, according to the report, even to prescribe anti-viral medicine to pregnant patients with the flu. "We are fighting an uphill battle to tell obstetricians across the country, 'Be wary of the flu, and yes, jump on them and treat them,' " says Hoskins, who is a designated spokeswoman for this issue for the American College of Obstetrics and Gynecology. "Many of our obstetricians and family practice people and midwives who care for pregnant women don't get it. They really don't." Health officials have to convince pregnant women and their caregivers that flu vaccines are safe in general. 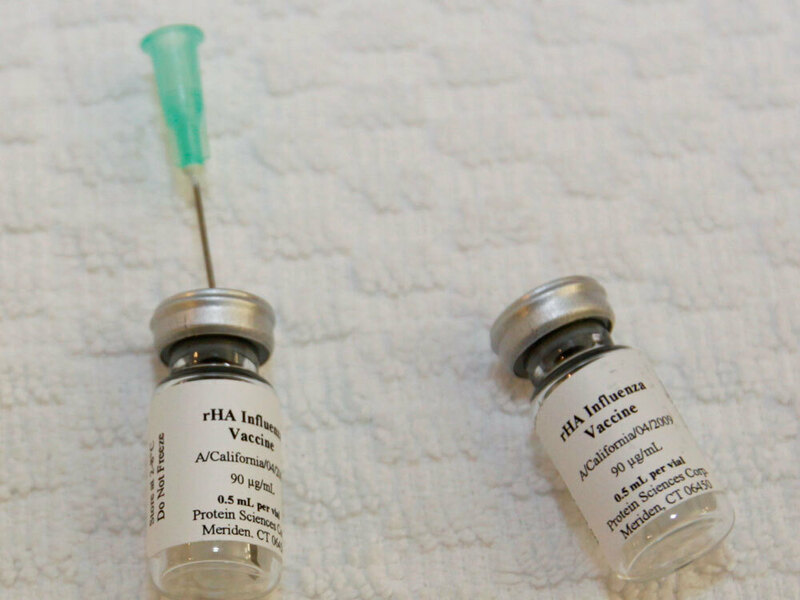 There won't be much, if any, specific data on the new swine flu vaccine in pregnant women. No tests are currently in the works with pregnant women, and even if they're eventually done, they won't be big enough or long enough to mean much. Dr. John Treanor, a vaccine expert at the University of Rochester, says experience with past flu vaccines is reassuring. "I think there is accumulated evidence that the vaccine is safe in pregnancy," he says. But there are other obstacles, Treanor says. Obstetricians aren't generally used to buying, storing and administering vaccines. "All of those nitty-gritty elements of actually vaccinating people, my understanding is, are typically not in place in many obstetrical offices. And that's kind of a barrier to vaccination." There's a deeper worry: that a pregnant woman who gets a flu shot may have a common event like miscarriage, and it will be blamed on the vaccine. "It will be," says Treanor, "and it will be hard to know for sure that it wasn't it." The trick, he says, will be to convince women and their doctors that this year in particular, the risk of a flu shot is much lower than the risk of doing nothing.